In 1973, Dr. Cammarata made history by becoming the first father in the United States to fight for and win a Paternity Leave from the New York City Board of Education, as a result of a new regulation at the Federal Equal Employment Opportunity Commission. The rest became – HISTORY! Since that trail blazing fight, he has continued to be an innovator as a parent, developing creative methods of childrearing. Dr. Cammarata is the author of, THE FUN BOOK OF FATHERHOOD, an autobiographical account of raising his children as the result of his receiving the First Paternity Leave. He is also a syndicated columnist (Father’s Diary), and a featured contributor to medical and political journals as well as newspapers nationally. Dr. Jerry Cammarata was appointed April, 2002 by the administration of Mayor Michael Bloomberg to be the Associate Executive Director of Coney Island Hospital, responsible for Development associated with the construction a new $104 Million medical tower to be completed in 2004. In January, 2003, Dr. Cammarata was given the additional responsibility to be Director of the Human Resources Department. 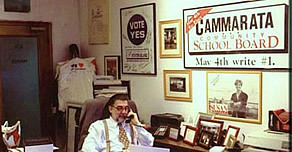 In July, 2000, Dr. Cammarata was appointed the Commissioner of the Department of Youth and Community Development by Mayor Rudolph Giuliani. The Department of Youth and Community Development operated with a budget of $150 million, had a staff of 500 and developed and managed youth and community based programs including literacy, citizenship and after school (Beacon) programs. Prior to his appointment as Commissioner, Mayor Giuliani appointed Dr. Cammarata Chairman of the Youth Board of the City. While serving as Commissioner and Associate Executive Director, Dr. Cammarata also maintained a dual appointment as a Member of the New York City Central Board of Education, appointed to that position by Borough President Guy Molinari in 1995 and served two terms. As an advocate for children’s rights, he had been responsible for 1.2 million students, 1100 school buildings, an educational budget of $12 billion and a capital budget of approximately $7 Billion. Dr. Cammarata is currently the Chief Operating Officer, Dean of Student Affairs, and Associate Professor at Touro College of Osteopathic Medicine – Middletown. Concurrently he is the World Safety Organization Liaison to the United Nations. Professionally, Dr. Jerry Cammarata is a healthcare management consultant specializing in Human Resources, Risk & Emergency Management, OSHA compliance and medical/nursing facility education to over 120 hospitals and nursing homes in the New York City Metropolitan area. Dr. Cammarata is a Professor of Business and Management at Metropolitan College of New York as well as Adjunct Professor at the City University of New York in Personnel Management, Safety Technology, Fire Protection, Consumer Protection, and enjoys faculty privileges at Wagner College and St. Joseph’s College (New York) in the areas of Communications and Health Care. Dr. Cammarata’s academic qualifications include his undergraduate degree from Hofstra University and graduate degrees from Hofstra University and California Coast University. Jerry also has been awarded the Honorary Doctor of Science degree from Mercy College, Doctor of Humane Letters Degree from Dowling College and the Presidential Medal of Honor from St. John’s University. Phi Delta Kappa of Columbia University has named him Educator of the Year. Besides his career work in health, safety and education, he is a licensed Speech/Language Pathologist, as well as a licensed and Board Certified Audiologist and Certified Safety Executive. Dr. Jerry Cammarata was President Carter’s Appointee to the White House Conference on Families and President Reagan’s Appointee to the Selective Service System, and was the Chairman of the Civilian Review Board of New York City.